Pre-heat the oven to 170c/Gas mark 3 Remove the wishbones from the partridges and truss them as for roasting. Season the birds then heat some oil in a deep pan to smoking hot. Add the partridges and fry all over quickly to give a good colour then remove from pan. Allow oil to cool then add the onion and garlic. Sweat this for 5 minutes allowing them both to turn soft without colour. Add the chorizo and cook for another 2 minutes then add the smoked paprika and allow to cook for a further 2 minutes. Now add the pearl barley and stir to coat in smoked paprika oil. Add the white wine, bring to the boil and allow to reduce by half. In a seperate pan, bring the stock to the boil, then add this to the pearl barley and bring to the boil for 3 minutes. Place the partridges on the pearl barley, cover and place in the oven at 170c/Gas mark 3 for 20 minutes or until the pearl barley is cooked and has been absorbed. 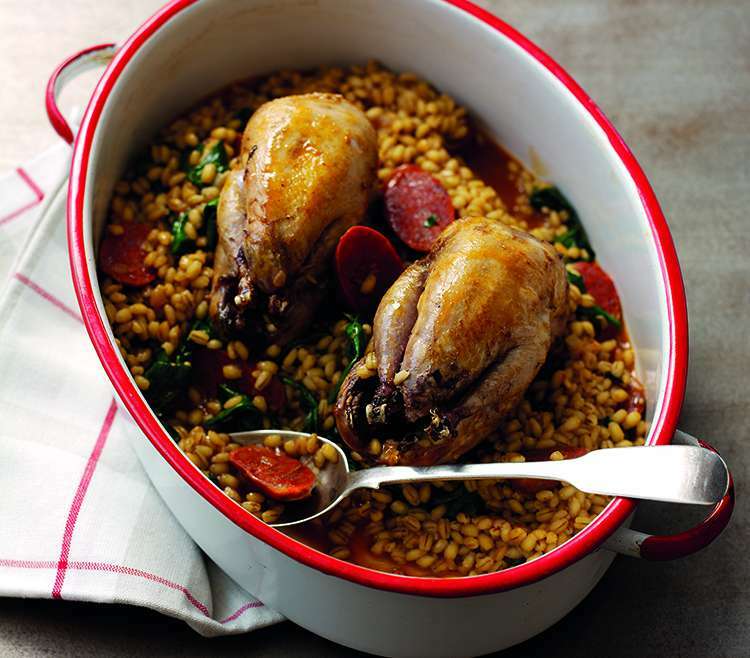 Once cooked, remove the partridges from the pearl barley and stir in the spinach so that it wilts and mixes well. Season, serve and enjoy.